With 100 percent of precincts reporting at 8:15 p.m.
Lou and Bill Flanagan at Flanagan's watch party Tuesday night. Election results came in quickly Tuesday night with Mayor Bill Flanagan reclaiming his seat by a margin of 129 votes. 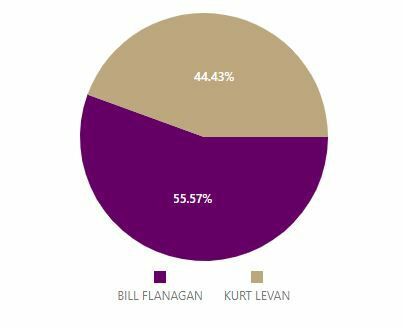 A total of 1,159 votes were cast with 55.6 percent going to Flanagan and 44.4 percent going to Kurt Levan. In concession Levan said, "I would like to thank the people of Claremore for really taking ownership in their community this past election. I want to congratulate Mr. Flanagan on his victory and I hope that this experience has opened his eyes to a lot of the issues that this city is facing." "He is aware of a lot more issues that are going on and I hope he uses that experience to manage the city council and city manager a bit better," Levan said. Flanagan said, "We're pleased with the outcome and we're going to continue to do the job we started five years ago, working to improve the city of Claremore and make it a city that you'd be proud to say you live here, you work here and you raise your family here."